August 20 was the date of Navigation #2 and the weeks keep ticking past without successfully undertaking the important Navigation #3. Nav 3 is a test flight to see if the student is ready to go solo, that is head out beyond the safe boundary of the Jandakot training area alone. Sunday just gone was our next attempt at a scheduled flight. This time it was cancelled due to poor weather, NO!!!! After weeks of trying to line up grade 2 or higher instructor, it is a disappointing blow. That frustration increased when the book said the next opportunity for a grade 2 was early November, no other options were available. 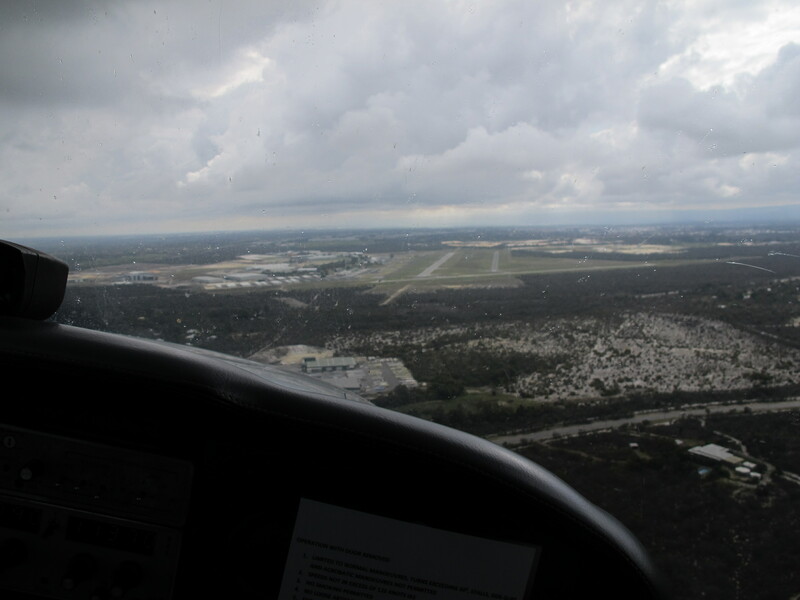 We readied VH-IGY and we headed out to runway 06 right. India Golf Yankee clear for take-off. We joined the now empty circuit and marvelled at the impressive climb and performance of this steroid enhanced Cessna 172. Even with such a low air pressure over the field, she still popped regularly above 1000 ft per minute. It meant the circuits were relatively quick. With the imminent storm and particularly low cloud, it felt like we had a duck a few times to keep our heads out of the clouds. On the third circuit after being cleared for a touch and go, it was soon recalled and I we were advised we were to make a full stop landing. Not happy! On late finals, the tower gave us the option for a touch and go. Sweet, we took it and went for another circuit. It was on this circuit however we were given the option of only a full stop and we landed. At least the newest member of the Air Traffic Control team at Jandakot granted the use of 06 left to save our taxi time after landing. Taxi’ing in, I wouldn’t realise it yet, but that was probably the last time I’d fly VH-IGY, well at least till my PPL is finished anyway. See my frustration returned in the days after that flight as the challenge to get an instructor wasn’t resolved. It was with that, that I took it into my own hands to resolve the instructor issue. It sadly means heading to another flight school for the remainder of my PPL. With a pass up and down the strip at Jandakot, I found what I was looking for. At this point I want to say a huge thanks to Adam, Chuck and the great team at Air Australia. I’m pretty sure if I was starting out again, Air Australia would certainly be where I’d head again. In fact, I’m pretty sure I’ll be back there after my PPL to get my aerobatics rating. However for the next few months, Jandakot Flight Centre (JFC) will be where I’m heading to finish my PPL. With several instructors available to work with me, we’ve got a good few bookings over the coming weeks. So a target PPL completion timeframe of late November is quite possible. On Saturday just gone I had my orientation at JFC and was impressed with the rigour and attention to detail. There are comprehensive checklists for everything, a big focus on safety and the a good collection of aircraft. The two aircraft which will see me to the end of my PPL with be VH-NMN and VH-VMH. 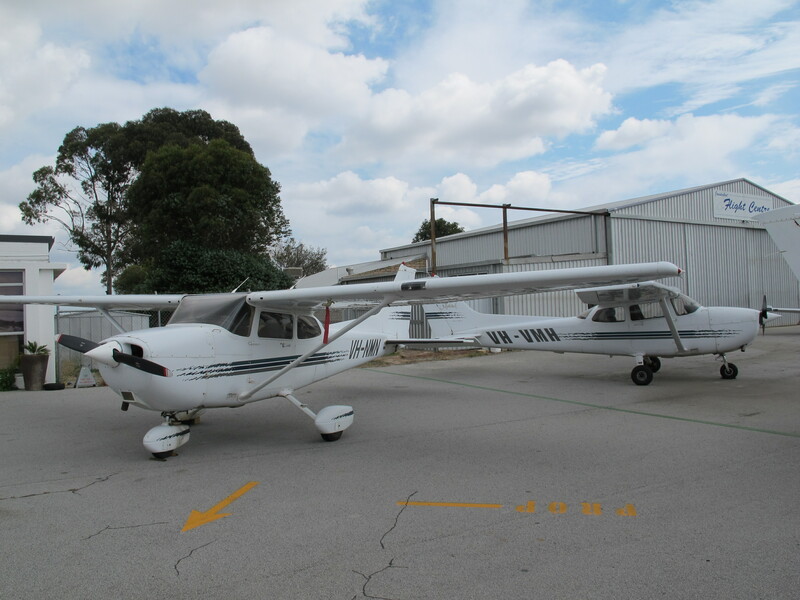 They are both Cessna 172R with 180hp engines. We had a good look around the fleet, a heap of single engine and twin engine aircraft. The big daddy being the King Air B200 turboprop. 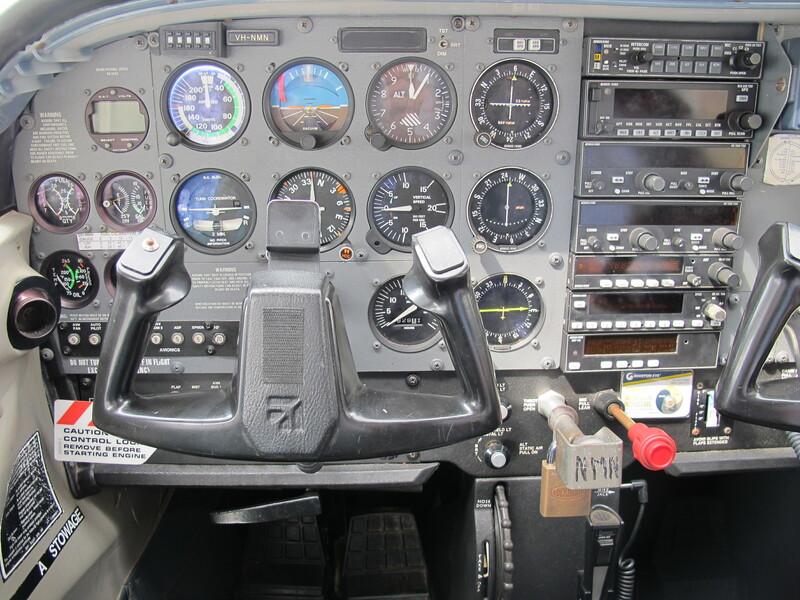 The two Cessnas were manufactured in 1997 and the cockpits are identical. Every single button between the two aircraft is exactly the same. During the orientation we sat in the cockpit for a good while going over every button and how everything worked. This included the impressive avionics stack. Apart from 2 com radios, there is a GPS (Bendix King 89B), an autopilot, ADF, VOR and transponder. Being different from what I’ve been using, we covered the lot. The GPS however is going to take some time. I’ve downloaded the user manual and the free computer based simulator to try practice with. The good thing is that by the time my PPL is done, I’ll also receive endorsement for using the GPS to assist with Navigation, an unexpected bonus. 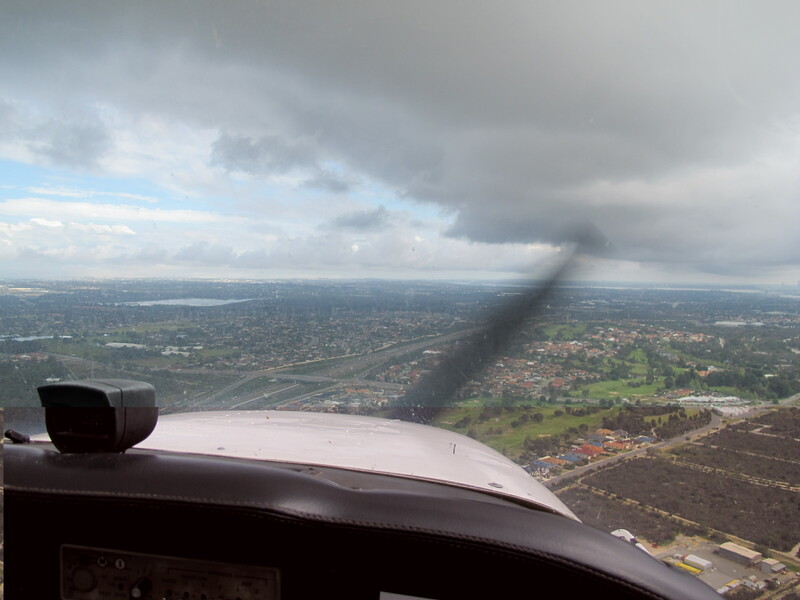 This entry was posted in Jandakot, Navigation, Pilot License and tagged Air Australia, airport, Cessna 172, Circuits, clouds, Flight, flight school, Jandakot, Jandakot Flight Centre, JFC, landing, Plane. Bookmark the permalink. Mate! A quick question. Is Warick still there at Air Australia? I haven’t had the chance to even get my first nav done since my GFPT. I think I saw you at Air Australia when you were doing your theory with Adam a couple of months ago. I was also keen on getting my PPL before Christmas but it sounds like I might to go elsewhere. Hopefully I can get this nav done soon, it has been more than two months since I have been flying and I’m really missing it!